You don’t have to labor for hours to design charts and graphs in your reports. 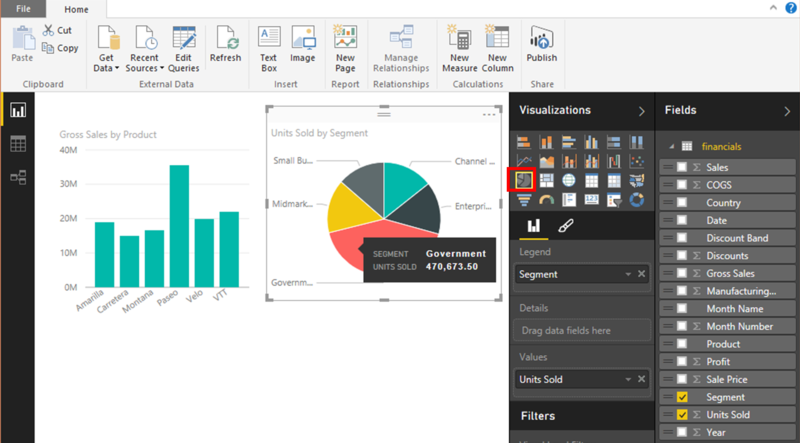 By using the intuitive Power BI tools, you can use drag-and-drop gestures to create stunning visual reports in a few minutes. 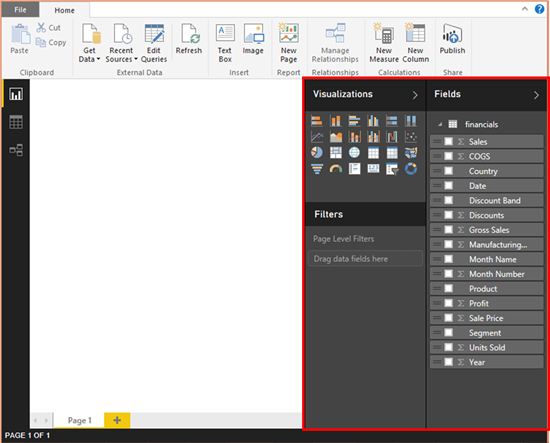 Here’s an example of how easy it is to create a report in Power BI Desktop. 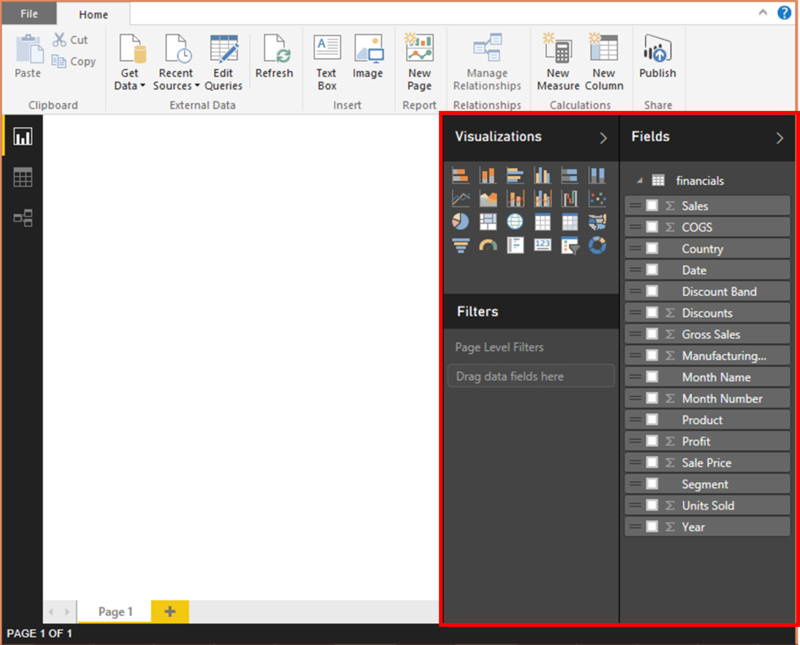 Begin by loading a dataset into Power BI Desktop. Use the Get Data menu to connect to a dataset from a file, database, or online source. 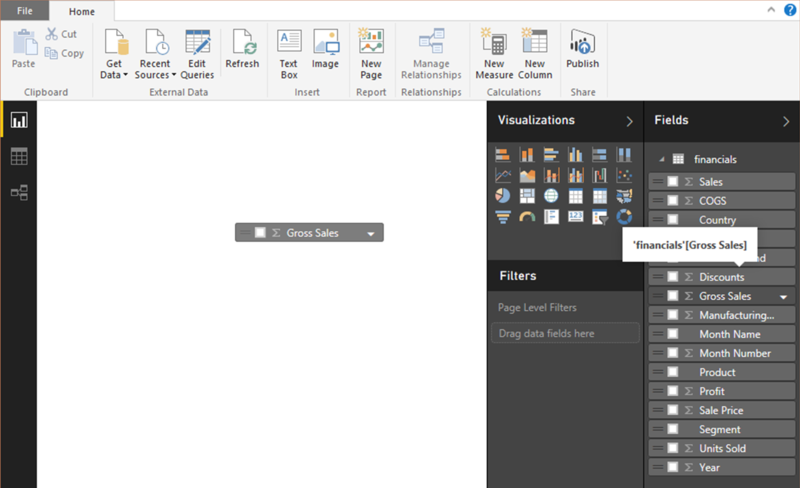 You might want to experiment with the Power BI industry sample datasets, which you can download from the Power BI website. Notice the panes on the right side of the report editor. The Visualizations and Filters panes control what your visualizations look like. The Fields pane displays the data tables and fields that that you use to create your visualizations. Suppose you want to display total gross sales in your report. In the Fields pane, drag the Gross Sales field into the display area. Power BI creates a bar chart automatically. You want to break down gross sales by product. In the Fields pane, select the checkbox next to the Product field. 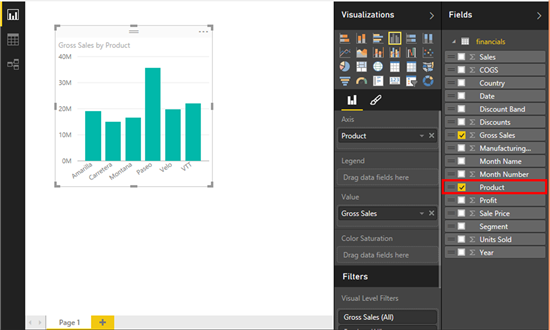 Power BI modifies the bar chart to display gross sales by product. Now you want to create a second visualization that displays units sold by market segment. From the Fields pane, drag the Segment field into the display area. Power BI lists the categories in this field. To add units sold to this table, in the Fields pane, select the checkbox next to the Units Sold field. To display this table as a bar chart, in the Visualizations pane, click the bar chart icon. 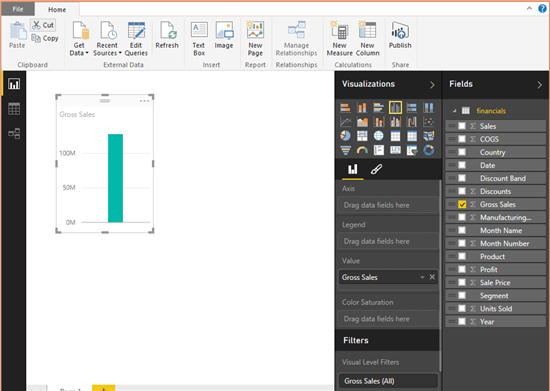 Power BI converts the table into a bar chart. Perhaps you want to display a data category such as Units Sold as a single number. From the Fields pane, drag the Units Sold field into the display area. Then in the Visualizations pane, click the card icon. 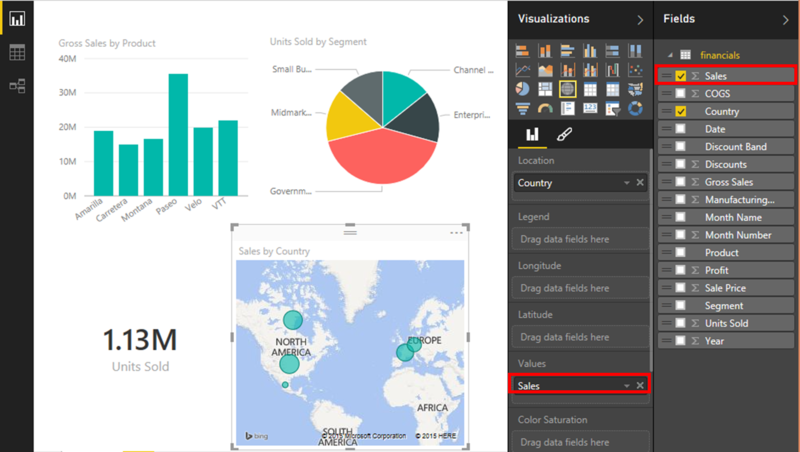 Power BI displays Units Sold in a single number card. What about displaying data in a map format? Easy. In the Visualizations pane, click the map icon. Power BI adds a map placeholder in the display area. Notice the configuration fields that display below the Visualizations menu. From the Fields pane, drag the Country field to the Location field in the Visualizations pane. Power BI creates a map with the locations marked as bubbles. On your map, you want to display sales by location. From the Fields pane, drag the Sales field to the Values field in the Visualizations pane. Power BI adjusts the map so that the bubble size reflects the sales value in each location. You can further refine your visualizations by filtering data, add legends and axis labels, and changing the colors in the charts. All with easy-to-use, intuitive tools. Try creating your own Power BI reports in just minutes. Sign up for free today.